I. How do I add and maintain citations in My Bibliography? II. How do I set public access compliance statuses and interpret status symbols? III. How do I associate awards with citations? 1. How do I get my publications into My Bibliography? Sign into your eRA Commons linked My NCBI account. For those publications that have citations in PubMed, search by author name in PubMed and use the Send function to import them into My Bibliography. Note 1: Full author name search may not always be comprehensive, so you may try last name, followed by initials. Note 2: If you do not select citations using the check boxes, all of the citations from a search will be sent to your Bibliography. If a publication is not cited in PubMed (or is in press), you can create the citation manually. 2. How did this citation appear in My Bibliography? I didn’t write it and I didn’t add it to My Bibliography. When another author associates their citation in their Bibliography or the NIHMS system with your award, that citation will appear in your Bibliography automatically. This will make reporting and tracking the compliance status for all citations associated with your award easier. 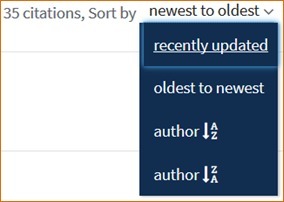 A notification will appear in your Bibliography any time a new citation is added in this way. 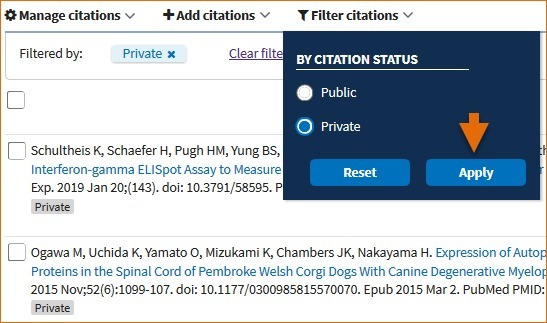 If you would like to keep citations you have not authored separate, you can select them and click Move to send them to the Other Citations collection. The Other Citations collection has the same reporting and compliance monitoring functions as My Bibliography. You can also filter the view of your Bibliography to see only those citations added by other PIs, citations associated with a particular award, or a combination of those. For more information on collaborating with other authors on making grant paper associations and tracking compliance, see this Technical Bulletin. 3. I have more than one citation for a publication in My Bibliography. How do I delete a duplicate? Collapsing two citations into one is usually easier than deleting one of the duplicate citations. To collapse duplicates, check to see if one of the duplicates has a PubMed ID (PMID). 1. Access your My Bibliography and use the Award display setting. 2. Locate the PubMed citation and copy its PMID number. 3. Locate the corresponding manually-entered citation, recognizable by the pencil icon next to its title. 4. Click on the pencil icon to enable editing. 5. In the resulting form, enter the PMID number in the available PMID field. You can ignore the rest of the fields. Based on the PMID number, the system will be able to match and remove the duplicate and also transfer all of the grant associations from the manual citation. To collapse manually entered duplicates (where you have no PMID) edit all fields in the editing form so that they are identical between the duplicate citations and the system will be able to recognize and collapse the duplicates. If you have two PMIDs for two citations, and you are sure that the two citations are the same, click “Write to the Help Desk” near the bottom of My Bibliography. If you have duplicates where each member has a different NIHMS number, contact the NIHMS help desk through their web form accessible at http://www.nihms.nih.gov/ to have one of the submitted manuscripts removed. 4. I have an unwanted citation, how do I delete it? Generally, papers can be disassociated from a grant in the PI’s My Bibliography account. You can check there to see if a lock (padlock) is next to the award. If there is no lock, click “Add or delete award” and unselect the award in question. If that does not work, follow the general guidelines in the My NCBI help guide on deleting citations. Note, the citation may have locked award(s). View your citation in the award display setting and check for locks. Scroll over the lock for an explanation: a silver lock ( ) indicates that award was officially reported on a progress report via eRA Commons. A gold lock ( ) indicates that the award was associated with the publication through NIHMS. Complete citation(s) to be removed/disassociated. Include the NIHMSID, PMID, and PMCID if assigned. Reason for the disassociation. Non-compliance is not a valid reason. To delete a citation with a gold lock, contact the NIHMS help desk through their web form accessible at http://www.nihms.nih.gov/. See also the FAQ: This award did not support this research. The citation may be a duplicate. See the Deleting duplicates FAQ. 5. How do I link a citation to an NIHMSID? You will be guided by a dialogue, which will allow you to enter the NIHMSID. Be sure to save your changes to close the window. Linking citations to PMIDs automatically through My NCBI alerts. The My NCBI tool often recognizes and removes duplicate citations automatically. It also matches PubMed citations with manual citations and it alerts users about possible duplicates. To resolve the alert, follow its link in My Bibliography. Locate the corresponding manually-entered citation, recognizable by the pencil icon next to its title. In the resulting form, enter the PMID number in the available PMID field. You can ignore the rest of the fields. Based on the PMID number, the system will be able to match and remove the duplicate and also transfer all of the grant associations from the manual citation. 7. Can I manage my papers in another collection? Use the “Other Citations” collection in the Collections portlet to create a separate bibliography. Some investigators use Other Citations to track papers that they did not author and that were directly supported by their NIH awards. Other Citations works just like My Bibliography. Follow the steps as indicated in Creating a Bibliography or view a short video to create an Other Citations collection. 1. I don’t see any compliance status indicators in My Bibliography. What should I do? First, make sure your NCBI account is linked to your eRA Commons account. See the “Account Troubleshooting FAQ” on the NCBI sign in page. Second, change your display settings to “Award view” as described in the My NCBI help guide. 2. What is the meaning of the symbols in the award display settings? Please review the My NCBI help guide on managing compliance. 3. My manuscript has been submitted through the NIHMS and the citation in My Bibliography shows the NIHMSID. Why is this citation still marked as non-compliant and not in progress in My Bibliography? The citation is marked non-compliant if a PMCID is not assigned within three months of publication. You are required to submit your manuscript to NIHMS immediately upon acceptance for publication. 4. How do I switch a citation to N/A (not applicable)? The NIH public access policy only applies to peer-reviewed journal articles that were accepted for publication as of April 7, 2008, and directly arise from NIH funds active as of Fiscal Year 2008 and beyond. See http://publicaccess.nih.gov/determine_applicability.htm for full criteria. Publications entered into My NCBI in the non-journal article citation formats will be automatically marked as exempt from public access (not applicable). You can designate a journal article as not applicable by selecting the “Edit Status” link. You will be guided by a dialogue. From there, you can indicate if the journal article is: not directly supported by NIH funds; accepted for publication prior to April 7 2008; not published in a Latin alphabet; not peer-reviewed. Any of these choices will designate the paper as N/A. Note, N/A status is particular to each My NCBI account, and does not transfer to collaborators. Therefore, each PI will have to declare N/A status themselves. 5. How do I designate a journal article as submission Method B? Some authors make arrangements with a publisher to deposit the final published version of an article directly in PMC; this usually involves choosing the publisher’s fee-based open access option for publishing that article. A list of publisher programs that deposit using Method B is available at http://publicaccess.nih.gov/select_deposit_publishers.htm. To list a citation as Method B, use the “Edit Status” link by the citation and select that it was funded by NIH. The form will expand, allowing you to choose the proper response. Note: do not submit the manuscript to NIHMS yourself as this will result in duplicates and processing delay. 6. How do I designate an in-press journal article as submission Method A? Some journals automatically submit the final published article to PubMed Central. These journals are listed at http://publicaccess.nih.gov/submit_process_journals.htm. These papers display in the My Bibliography award view as provisionally compliant (PMC Journal In Process) until a PMCID is issued. To list a citation as Method A, you must enter the journal title using the autosuggest selection. Locate the corresponding manually-entered citation, recognizable by the pencil icon next to its title, and click ‘Edit Citation’ it to correct the journal title. Note, this citation would display as non-compliant with the public access policy if it was linked to an NIH award.